Check out my newest post on the Proxxon blog. 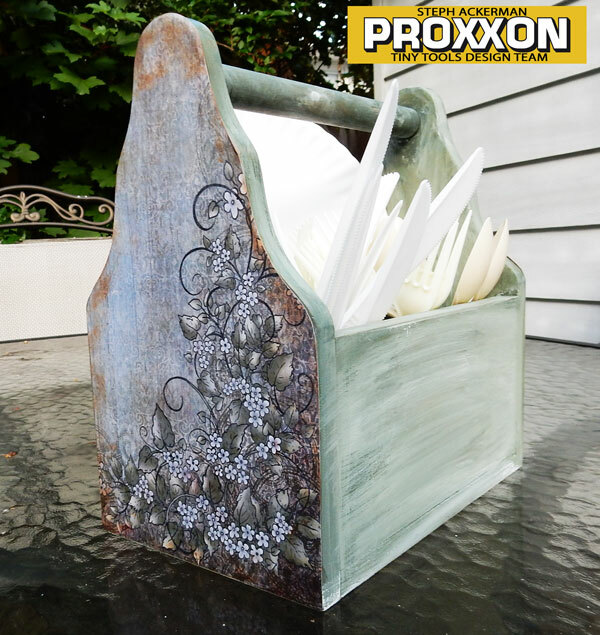 We all need something fun to hold our outdoor dining gear, so this wood basket was perfect to alter. Hi everyone, I wanted to create some fun garden accents so I reached for glass jars and etchall etching crème. 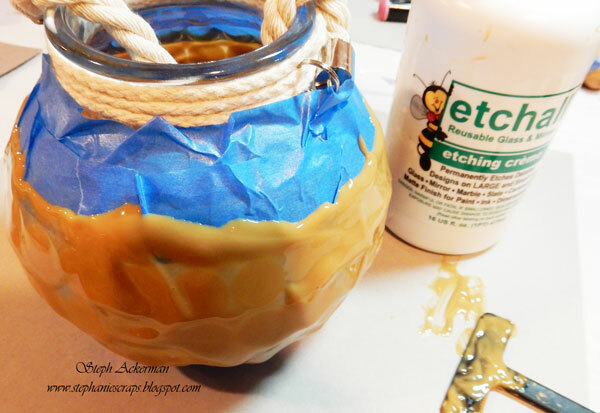 I didn't want to etch the entire jar, so I wrapped painters tape around the top and bottom. 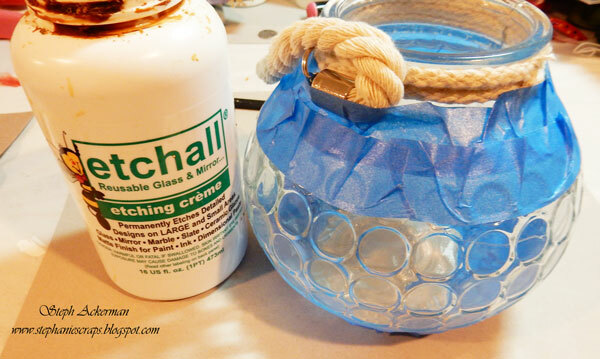 I lavishly applied etchall etching crème around the glass, leaving it in place for 15 minutes. I removed the etching crème and because the etching crème is reusable, I replaced it in the container. Then I washed and dried the glass. I love the effect. 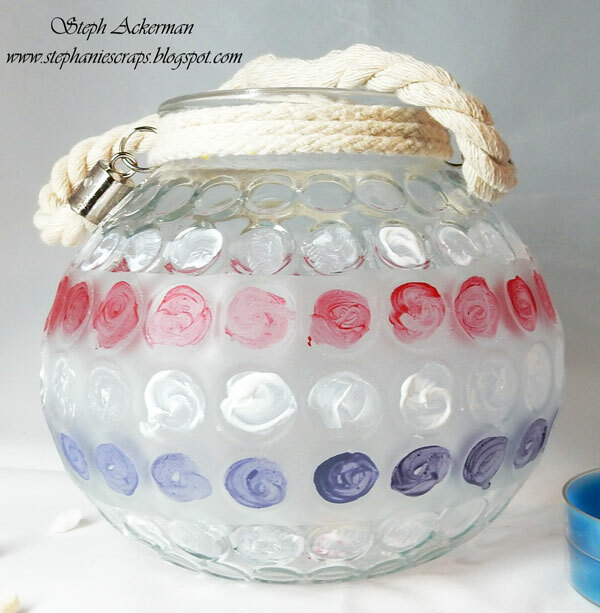 Then I painted the etched glass, knowing that the etching crème would allow the paint to adhere to the glass. 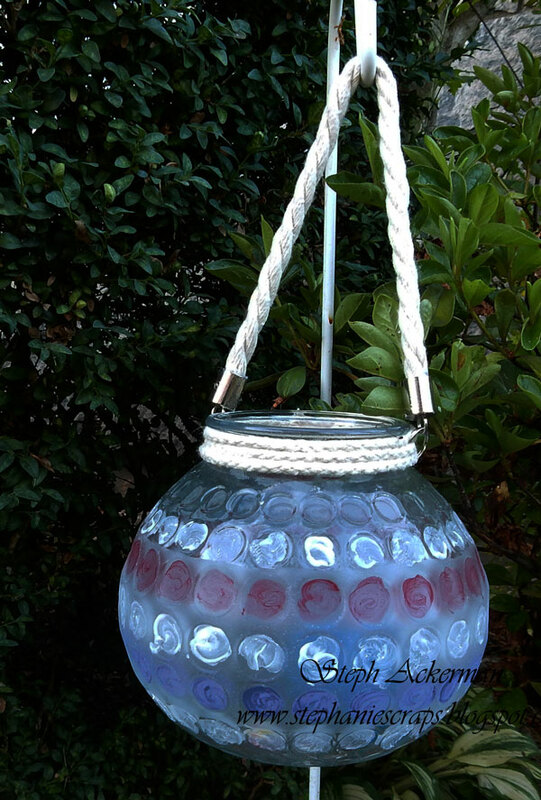 Now I have the perfect garden decorations - just light the candles and enjoy. My newest project is on the Paverpol blog. 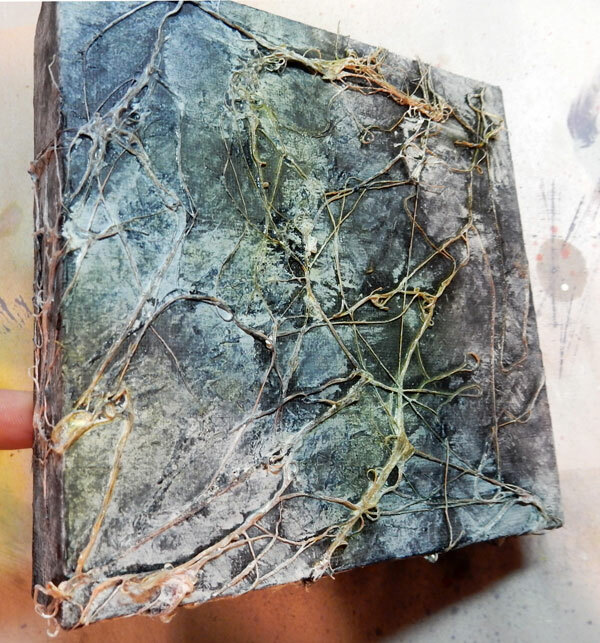 I had so much fun creating this canvas and the texture is amazing!! Please stop by the Paverpol blog for directions. 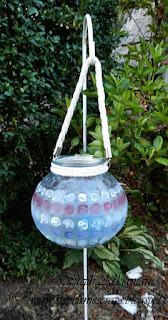 It's time to celebrate and I am participating in the Designer Crafts Connection blog hop this month. This month we are working with some fabulous products from Deflecto Crafts. 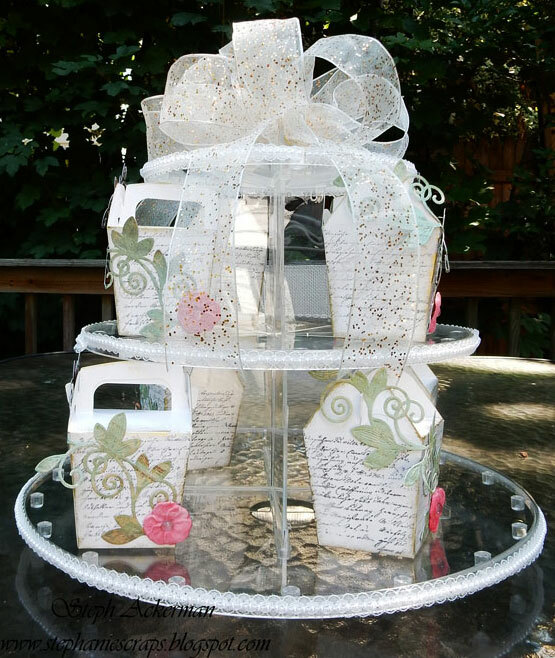 The Deflecto Crafts 3 Tier Dessert Stand is a fabulous product that can be used for so many projects. In keeping with the Celebration theme, I created a Dessert Stand that can be used to hold goodie bags for the guests using mini take away boxes. Around the edges of the tiers, I placed pearl ribbon, adhering it with Beacon's Fabri-tac. I created a ribbon topper with some pretty sheer glittered ribbon and the Bowdabra. 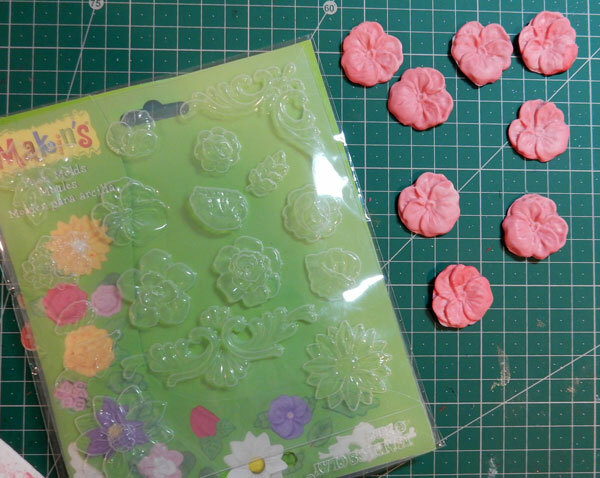 The flowers were created from the Florals Push Mold from Makin's Clay. 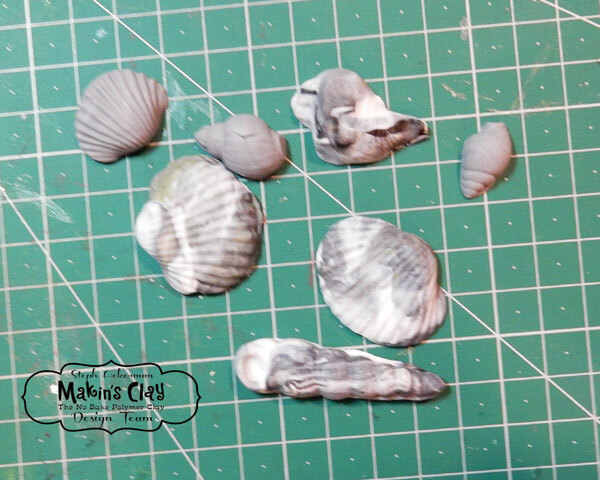 I combined white and red clays to get the perfect shade of pink. The treat boxes were stamped with a script stamp and the edges inked with gold ink. 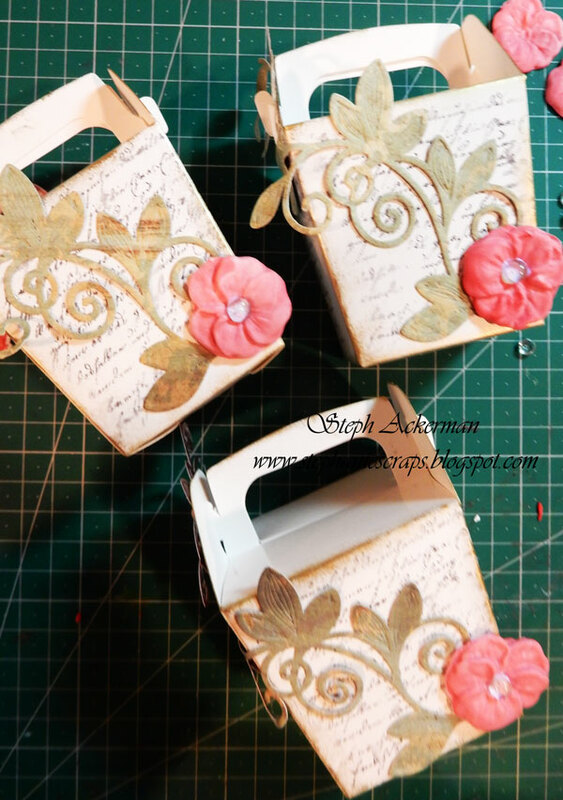 Spellbinders vines were adhered to each box and the clay flowers were added to the edges. 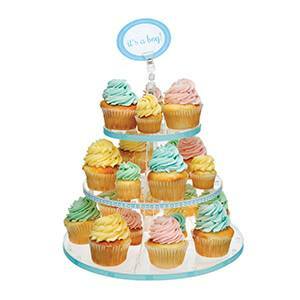 Place this Dessert Stand near the door and your guests can take their treat boxes when the party is over. 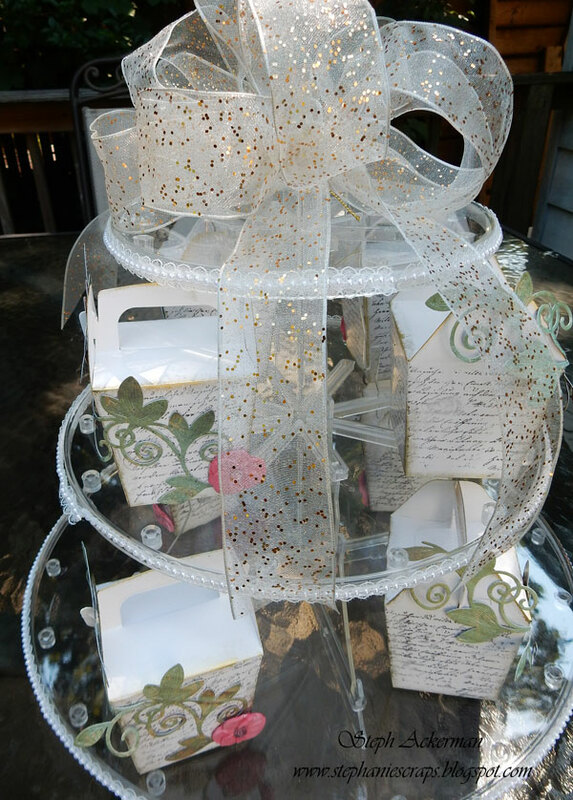 You can even personalize the treat boxes with the names of your guests. I'd love to know what you think of my Dessert Stand. 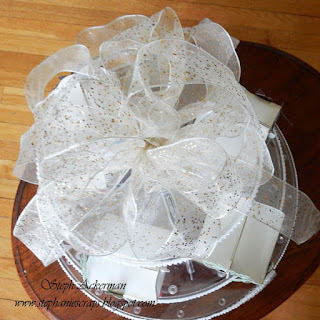 There is a give-away on the Designer Crafts Connection blog for a Dessert Stand. 1. Please leave a comment on my blog. 2. Please visit the Designer Crafts Connection blog and leave a comment. This is a sponsored post. Deflecto has provided product in exchange for my creative ideas, views and opinions. Hi everyone. 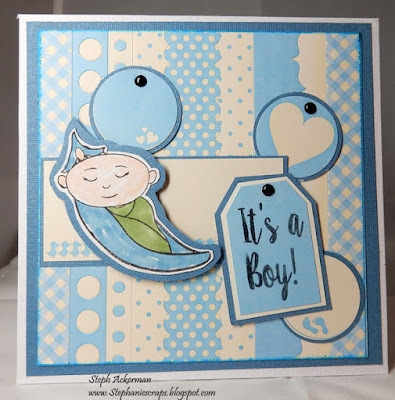 It's time to celebrate a new baby boy and Joy Clair has the perfect stamps to celebrate the new arrival. To create the backgrounds of my cards, I used sticker sheets. I simply left the stickers on the backing, cut to size and adhered it to cardstock. This is a perfect way to use your sticker stash! The stamps are from Joy Clair's Oh Baby Clear Stamp set and the baby bootie is a die from Die-versions. The Oh Baby Clear stamp set contains both boy and girl images plus words and is the perfect set to create an assortment of baby cards. The image was lightly colored with Copic Markers and then fussy cut. 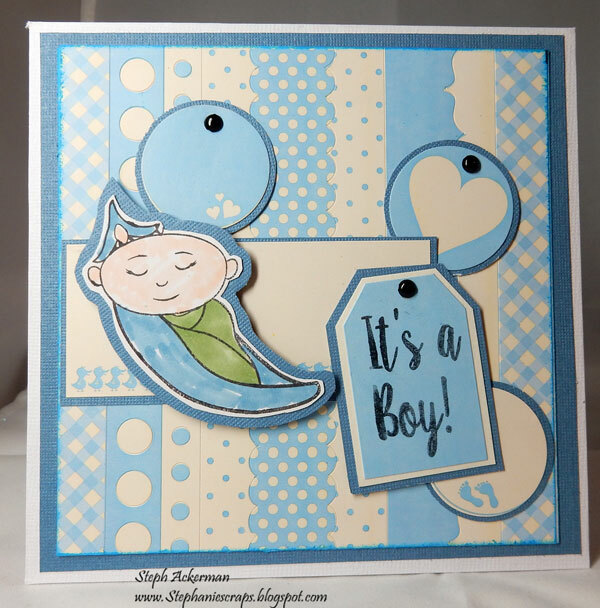 I placed additional stickers around the image, stamping "it's a boy" on a tag. This baby bootie from Die-Versions is so cute and delicate! 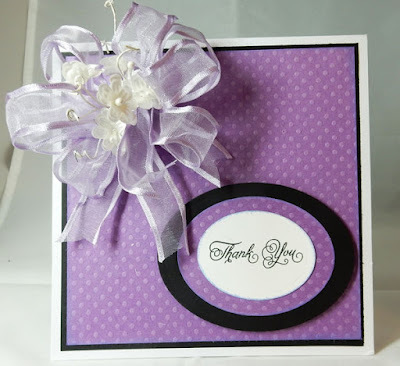 I placed it on a die cut circle and added several brads and it becomes the card's focal point. 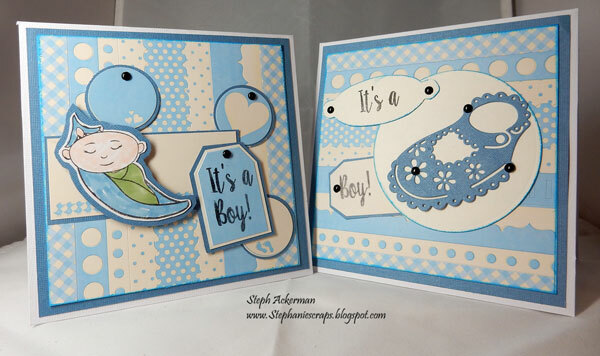 "It's a boy" was stamped on tags which were placed around the bootie. Hi everyone, it's time for a doggone cute birthday card. 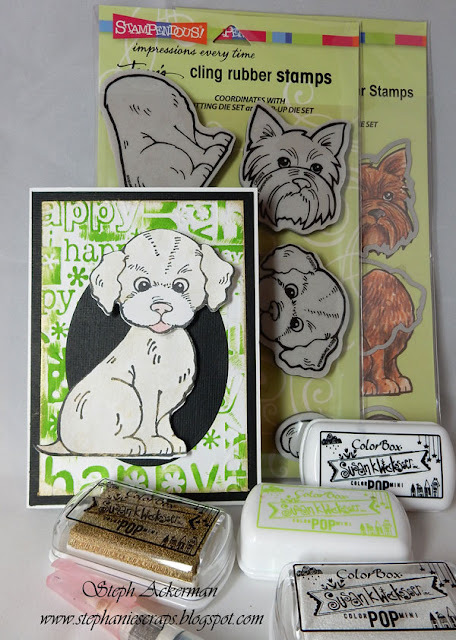 Stampendous has some amazing stamps and dies and I've used the Cling Pop Up Puppies Rubber Stamp and coordinating Pop Up Puppies die cut set. One of the dogs is the focal point of my card. Once die cut, I colored him with Colorbox® Color Pop Metallic Pigment Ink by Susan K. Weckesser in Shimmer using a water brush. On his tongue, I used Colorbox® Color Pop Pigment Ink by Susan K. Weckesser in Kiss and added Snow on his cheeks. The background is a Cuttlebug embossing folder. I inked over the embossed portions with Colorbox® Color Pop Pigment Ink by Susan K. Weckesser in Fresh, a gorgeous color. 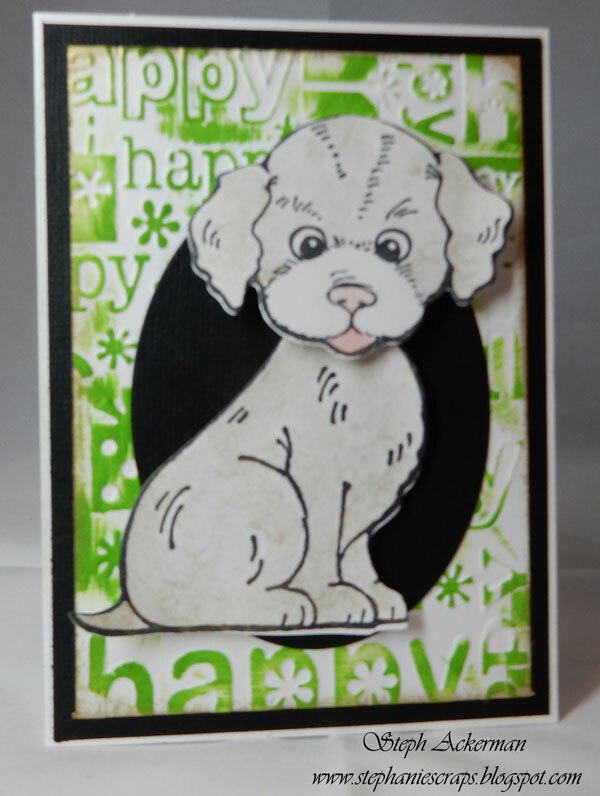 I matted it with black cardstock then added a black die cut oval for my dog. 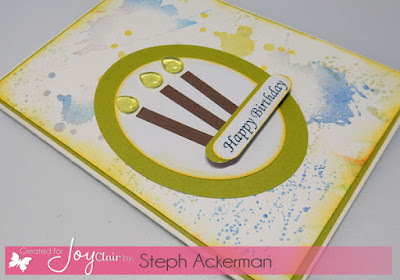 The Birthday Wish Stamp is also from Stampendous and was stamped with Colorbox® Color Pop Pigment Ink by Susan K. Weckesser in Mystery. 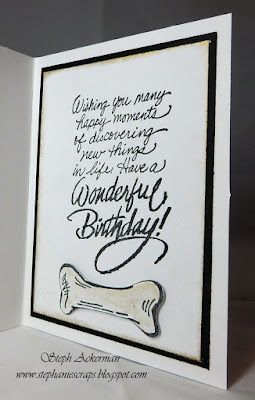 The bone was stamped and die cut then colored with Colorbox® Color Pop Metallic Pigment Ink by Susan K. Weckesser in Shimmer using a water brush before adding to the card with foam adhesives. Isn't he adorable? 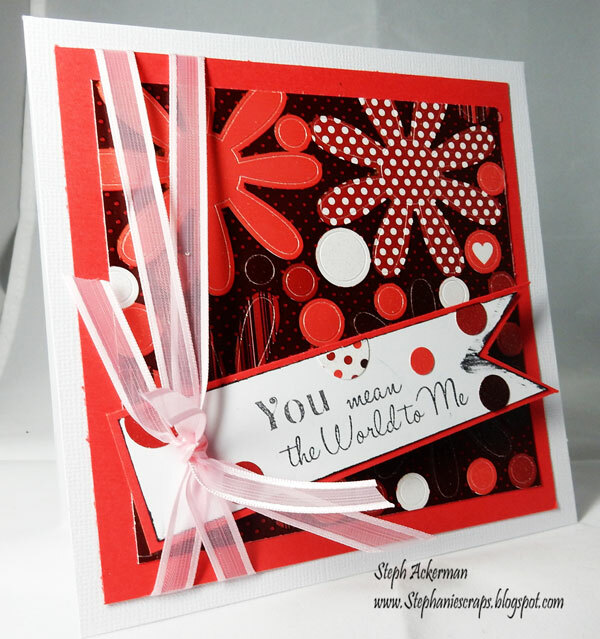 Who would you give this card to? 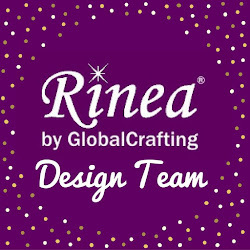 Please stop by the blog for more details and to see the amazing projects created by the design team. Hi everyone, check out the newest cards I've created for JoyClair. The full tutorial is on the JoyClair blog. I've used the Uh-Oh Ink Splatters, Puppy Love and You and Me sentiments clear stamps. 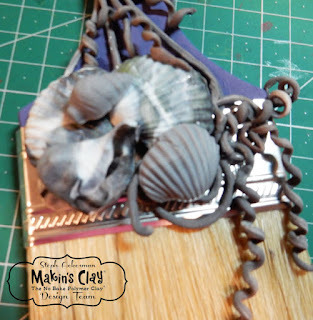 Mix up your ink colors and scatter them on the cardstock. Add paw prints in black and a multi colored sentiment on a die cut for a fun effect. Remember to stop by the store to see all the stamps that are available. 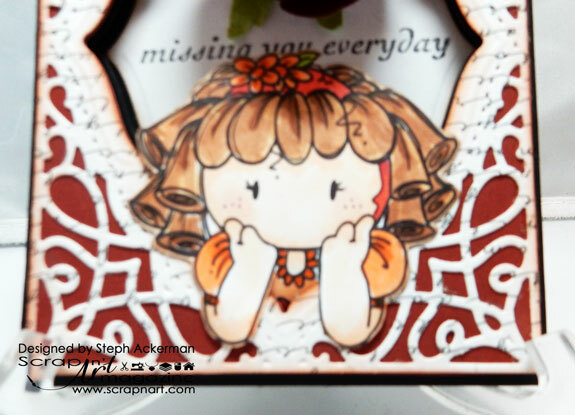 Have you seen the variety of My First ColorBox® Mini Stamps that are available at Clearsnap? Although they are geared for young stampers, these stamps are by no means just for them. 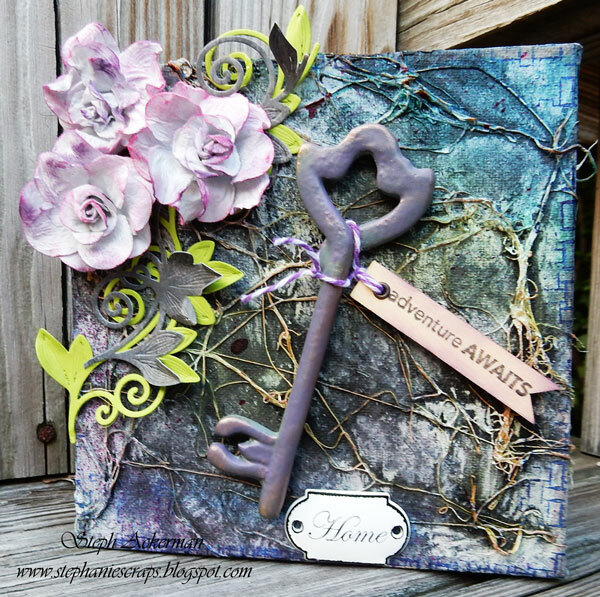 Each stamp set is housed in a metal tin containing 5 stamps. 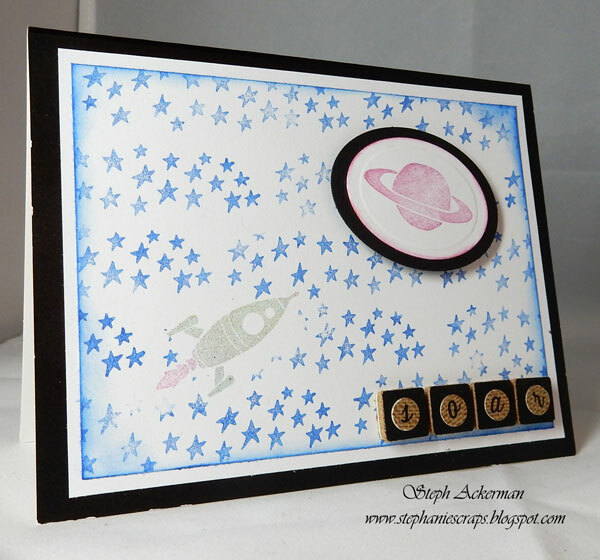 I've used the Galaxy and Birthday Mini Stamps. The card base is a Spellbinders die as are the candles and packages. I've used My First ColorBox® Dye Inks in Tree, Cherry and Boat. I've also used the Galaxy and Birthday Mini Stamps. 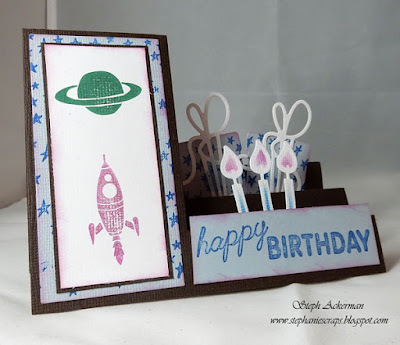 The space ships were stamped with My First ColorBox® Dye Inks in Mint and Cherry, then embossed. The background was stamped with the stars stamp and Boat ink. Happy Birthday was stamped in Mint and also embossed. I've used the Galaxy Mini Stamps. 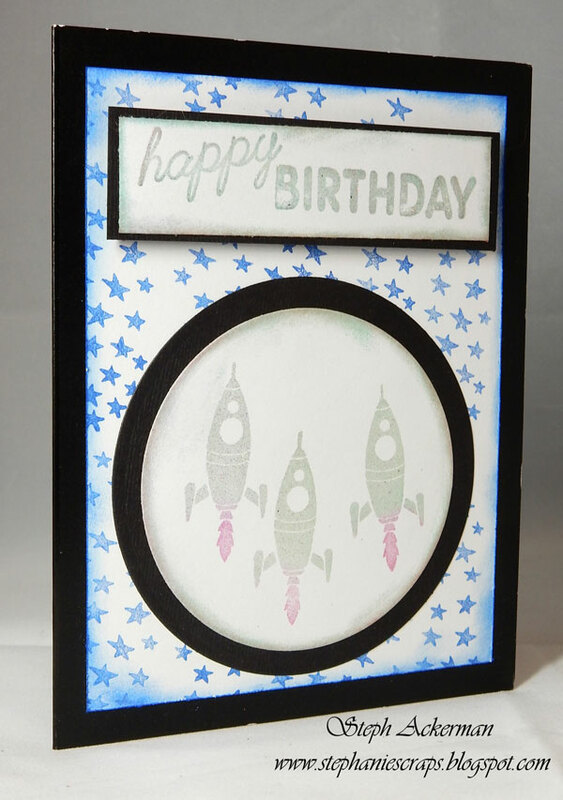 The space ship was stamped with My First ColorBox® Dye Inks in Mint and then embossed. 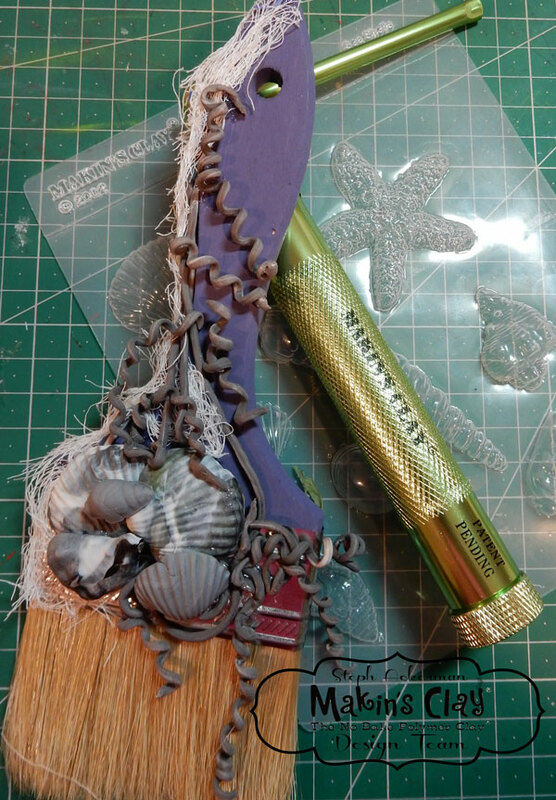 The space ship was masked and the stars were stamped with Boat Ink. Saturn was stamped with Cherry Ink, then die cut and added to the card with foam adhesives by Scrapbook Adhesives by 3L. Scrabble letters were added to spell out "soar". These are cute stamps and are definitely fun to work with. 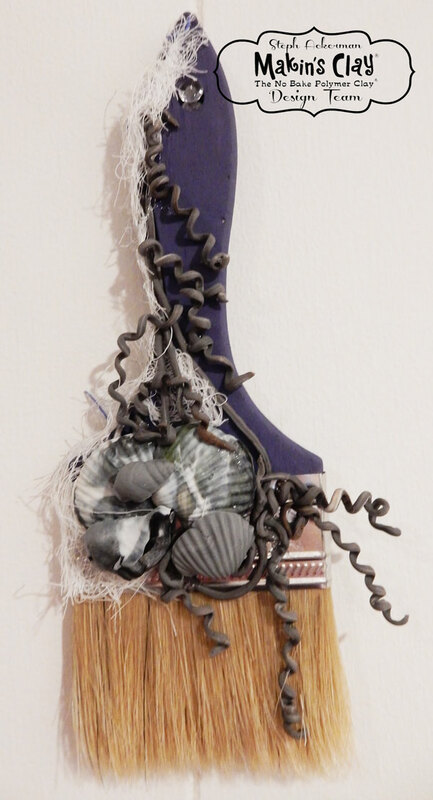 Hi everyone, I've got my first post on the Paverpol blog today. 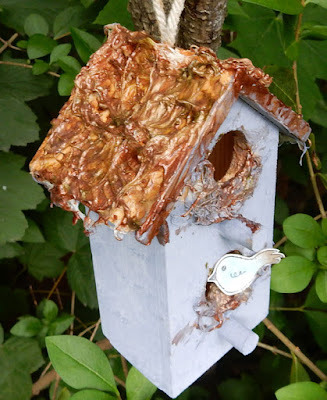 Please pop by the Paverpol blog to see how I created my bird house. 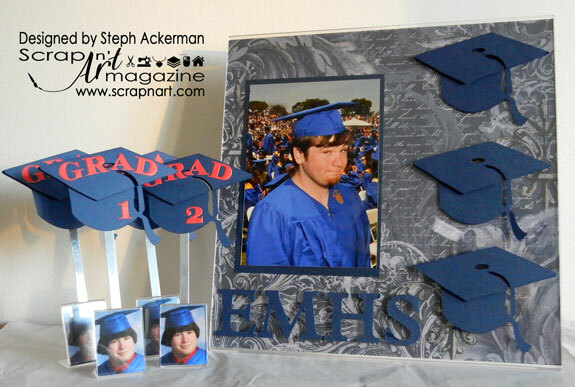 To showcase my son's graduation from high school, I created a photo display and place settings for a graduation party. 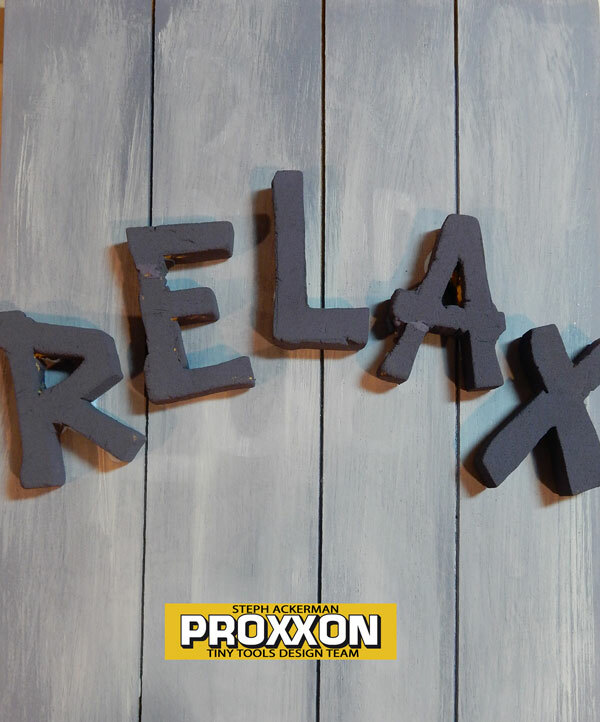 Deflecto Crafts creates a variety of products from Sign Holders, Frames, Hangers, Food Display and more. The large sign display at 12" x 12" was perfect for my son's graduation photo. The pattern paper slipped inside easily and I decorated the exterior with my son's photo and die cut graduation caps. And these mini photo frames worked out well for place settings. I slipped mini photos inside then adhered the sign holders to the back. 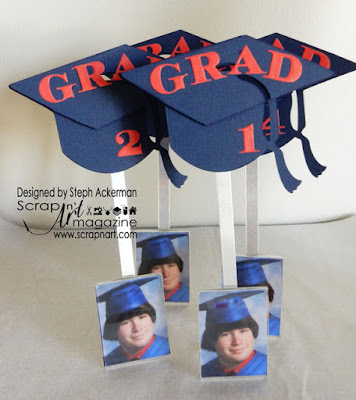 More die cut graduation caps were placed on top and stickers were used to show the table numbers. 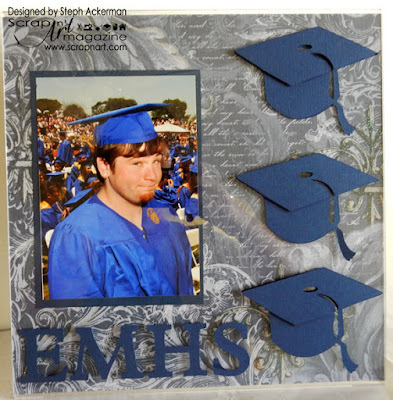 Deflecto Crafts creates a variety of products from Sign Holders, Frames, Hangers, Food Display and more. These are definitely fun projects to work with - the possibilities are endless. 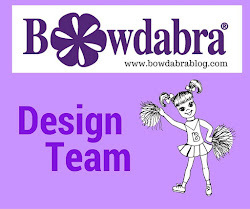 Hi everyone, my first post as a member of the Bowdabra design team is on the Bowdabra blog today. How about decorating flip flops? 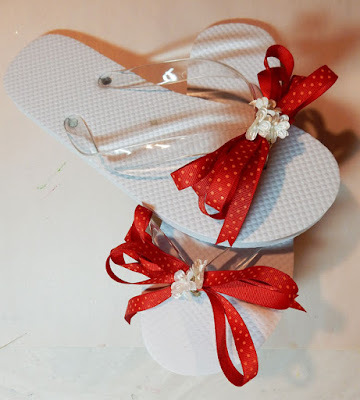 Using the Bowdabra bow maker you can easily create fun bows to decorate your flip flops. Please stop by the Bowdabra blog for the details. 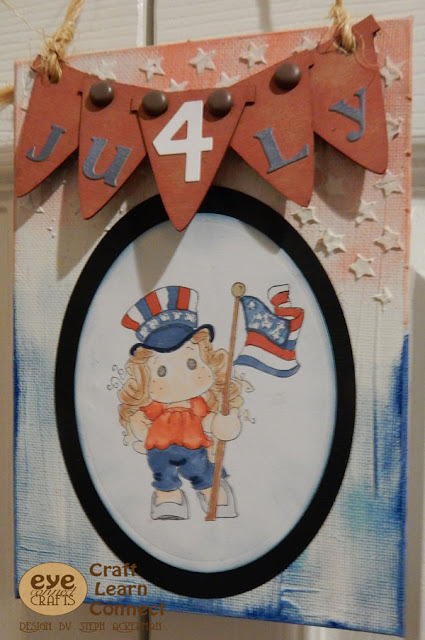 Hi everyone, I have a fun 4th of July canvas tutorial over on the Eyeconnect Crafts blog this month. 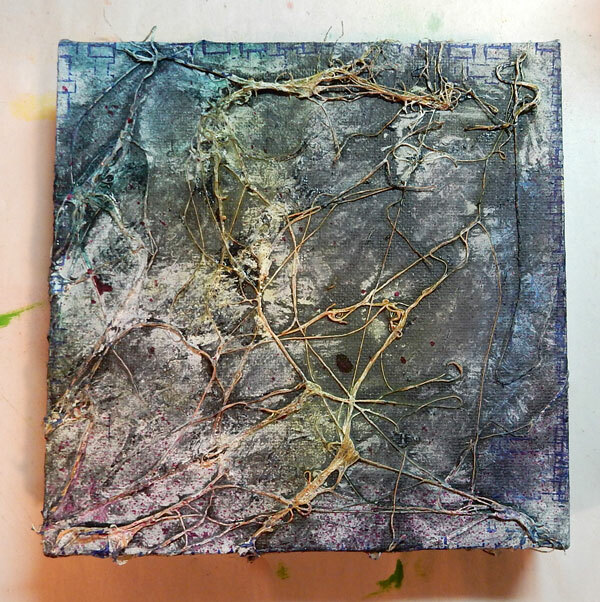 This 5" x 7" panel looks great hanging in my craft room. 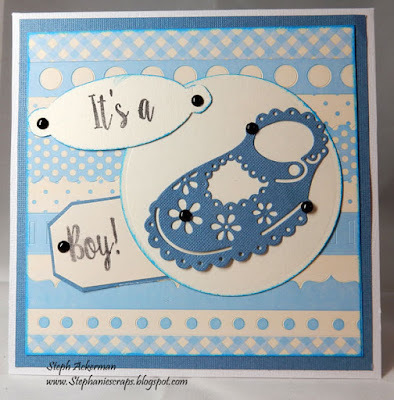 Hey everyone, a fun card I've created for Scrap 'n Art Magazine using Spellbinders dies, Bugaboo Digital Image, Unity Stamps and Scrapbook Adhesives by 3L. 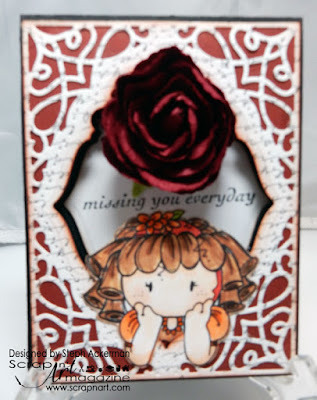 Die cutting the front of a card gives you such a nice effect and this Spellbinders die is amazing. 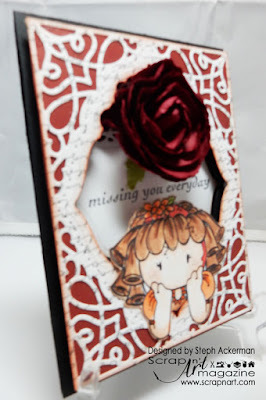 This Bugaboo image is so sweet and she fit perfectly in the die cut area. I even created a video - click here for all the details on how I created this card. It's new release day at Joy Clair and the new stamps are Uh-Oh Ink Splatter and Worship Him. Today I'm using Uh-Oh Ink Splatter. How much fun is this stamp set? 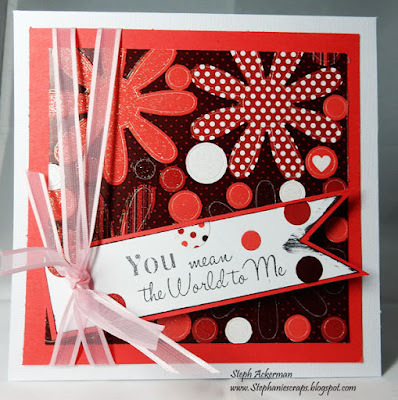 I stamped a panel of white cardstock with assorted stamps in assorted colors of ink. They truly do look like ink splatters don't they? 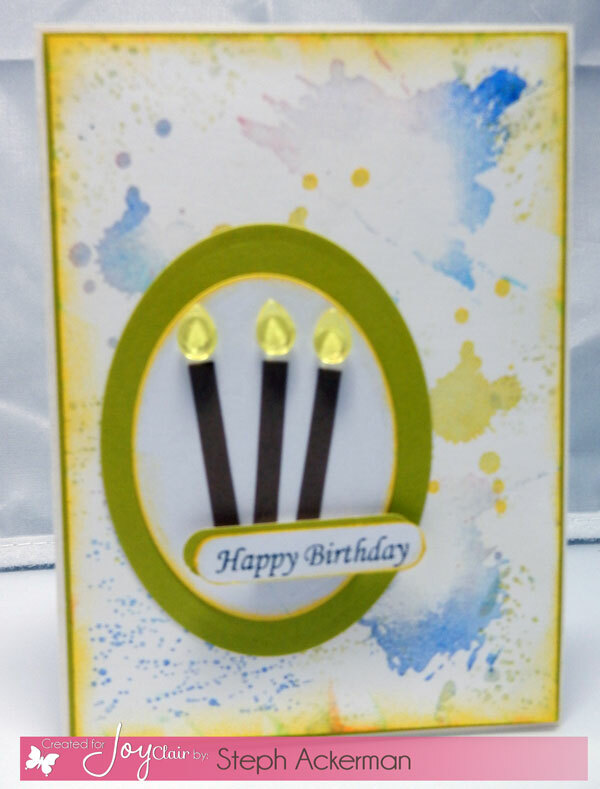 I added die cut ovals to the center of my card and fussy cut the candles. 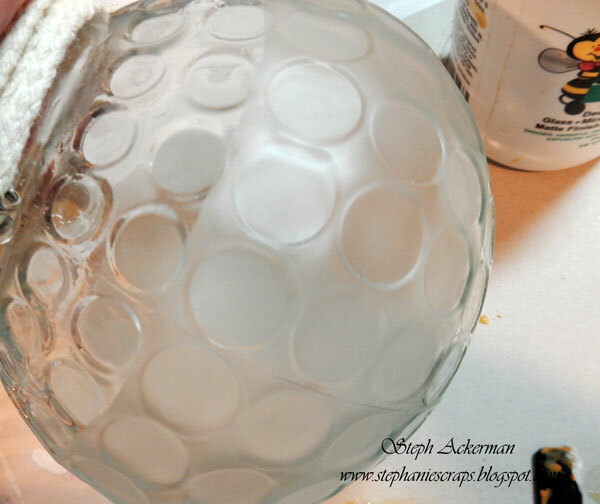 Wicks were created with Robin's Nest dew drops. 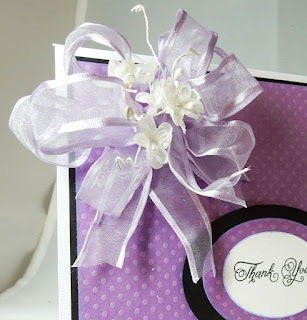 The Happy Birthday sentiment is from the Many Blessings stamp set which has an amazing 44 stamps! Here's the blog hop list. 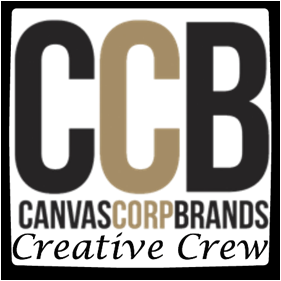 Please stop by everyone's blogs and see what they've created.